Adventure seekers and outdoorsy people can enjoy a 2-day guided tour to spectacular Fraser Island with a stop at Cooloola Recreation Area on the way. Walk through rainforest at Pile Valley, Central Station, Wanggoolba Creek and dip in the clear waters of Lake Birrabeen, Seventy-Five Mile Beach and Eli Creek. Ride in a 4WD vehicle down Seventy-Five Mile Beach to the Maheno Shipwreck and spend the night at a beach resort. Join a fun and informative guide to find adventures and natural beauty on this stunning island. 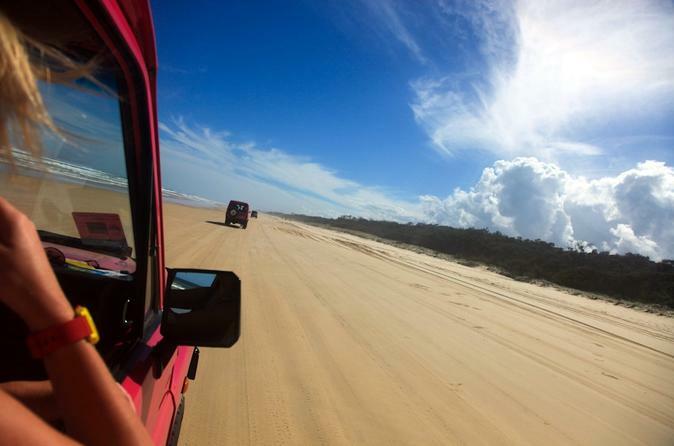 Explore the beauty of Fraser Island on a full-day tour from Noosa or Rainbow Beach by purpose-built 4WD vehicle. Travel off-road along uninterrupted white-sand beaches and admire the colored sand cliffs; see ancient rainforests and crystal clear lakes; and discover what makes the island a World Heritage-listed site. Soak up the incredible natural beauty of World Heritage-listed Fraser Island. You’ll walk scenic trails at Central Station, Wanggoolba Creek, Pile Valley, and the Hammerstone Sandblow, and dip into sparkling waters at Lake McKenzie, Eli Creek, Champagne Pools and Lake Wabby. Drive down Seventy-Five Mile Beach to the Pinnacles and Maheno shipwreck, staying overnight at a beach resort along the way. 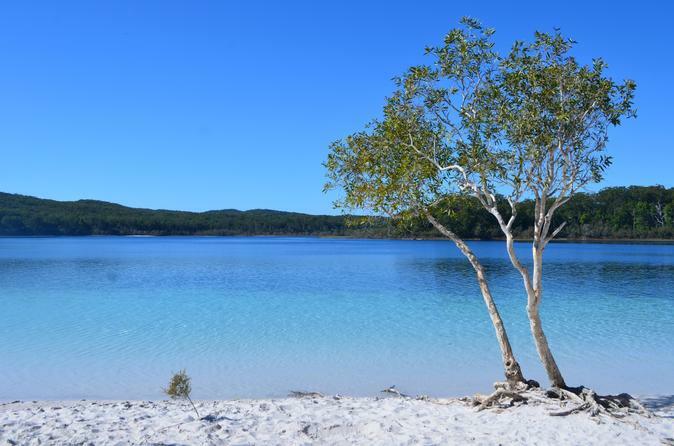 You'll travel with a knowledgeable local guide and have plenty of time for swimming and exploring as you experience Fraser Island’s treasures on this two-day tour. 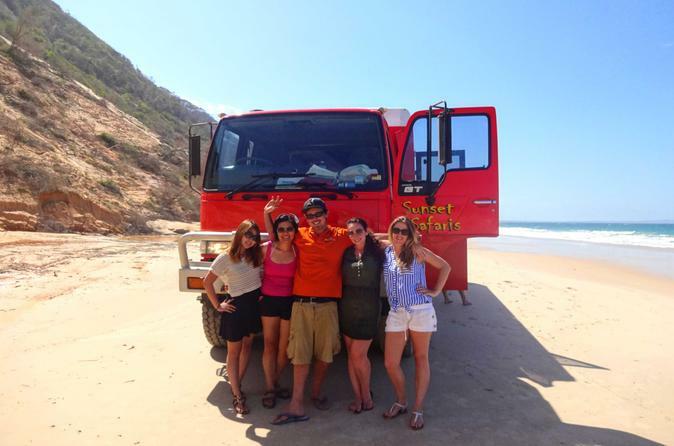 Explore the natural wonders of Fraser Island on a small-group day tour by 4WD vehicle. Highlights include Lake McKenzie, Eli Creek, Seventy-Five Mile Beach, the Pinnacles, and the Maheno shipwreck. 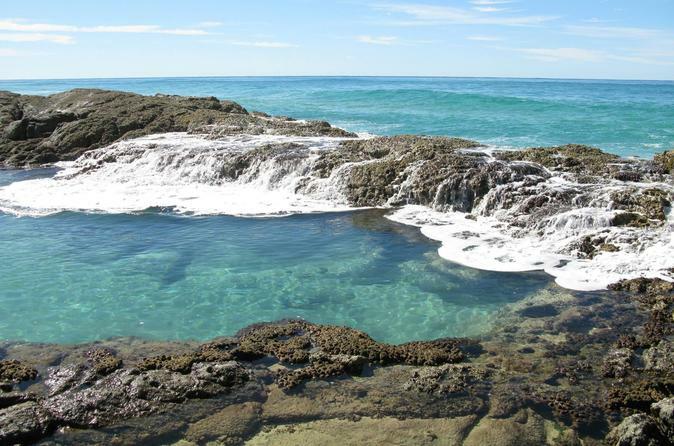 And how does a dip in the Champagne Pools sound? This is the only day trip that offers a chance to splash around in the sheltered cove with a name as delightful as its natural surroundings. Expect a refreshing morning tea, a delicious picnic lunch, and informative commentary about the island’s flora and fauna. You'll cover more of the island on this small-group tour limited to seven people. 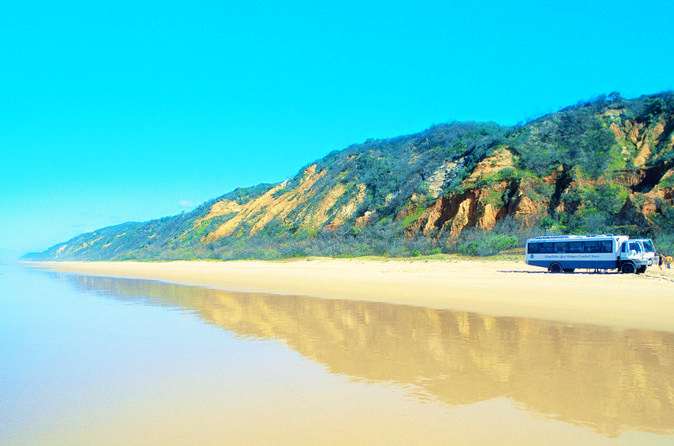 Explore Fraser Island, the largest sand island in the world, on a 3-day camping tour that travels tag-along style in 4WD vehicles led by an experienced guide. 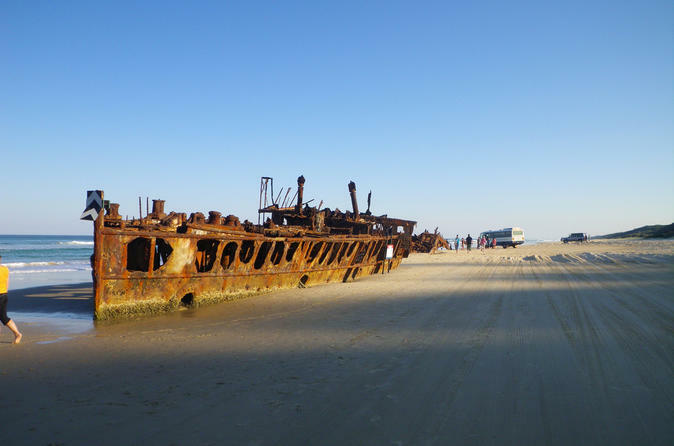 Visit Seventy-Five Mile Beach, the Maheno Shipwreck, the Pinnacles, Eli Creek, the Champagne Pools and more. You get to swim in freshwater lakes and ocean pools, traverse long sandy beaches, and walk through lush rainforest. Once you visit, it’s easy to understand why the Aboriginal people named it K’Gari, or paradise. 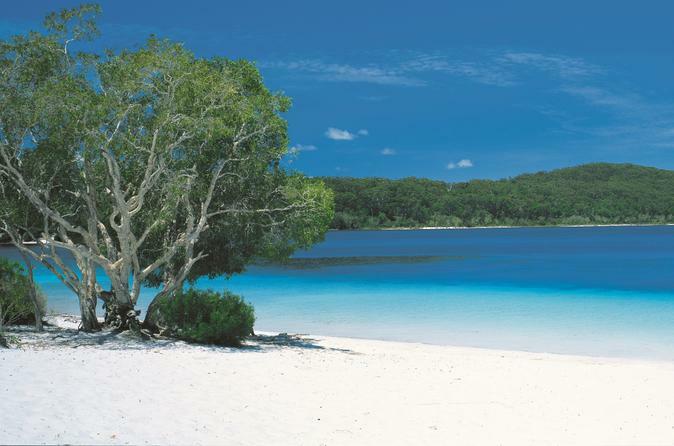 Discover Fraser Island on a 2-day tour that gives you time to explore its natural treasures. You might even get the chance to participate in an exhilarating tag-along where you get behind the wheel of your own 4WD vehicle! 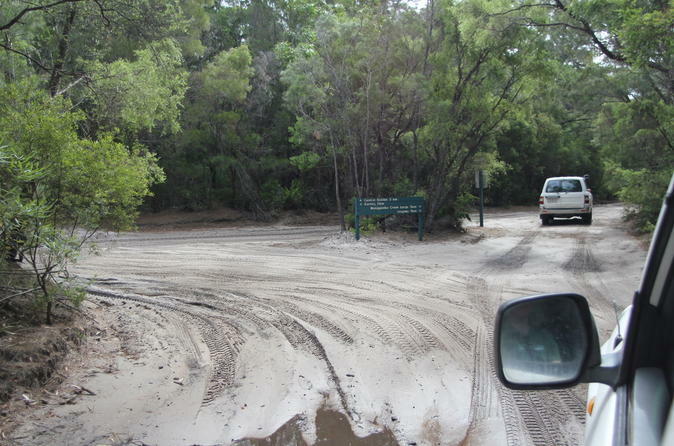 Expect to travel by comfortable 4WD vehicle to swimming spots at Lake McKenzie, Champagne Pools, Eli Creek, and Lake Wabby. For photo ops, stop at the Maheno shipwreck, the Pinnacles, Indian Head, and Seventy-Five Mile Beach. As the day wanes, head to a well-equipped campground for an overnight stay that includes a barbecue cookout. See and learn more with your expert guide on this small-group tour limited to 15 people. 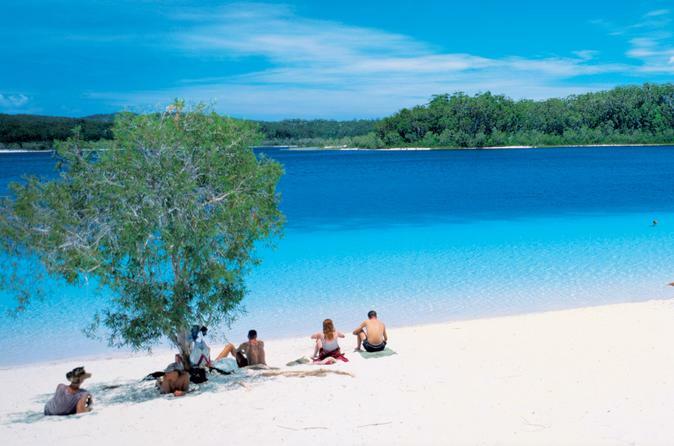 Experience the beauty of Fraser Island on a 2-day tag-along tour that highlights the best of the scenic island. You can take turns driving a 4WD vehicle in a tag-along led by your guide. 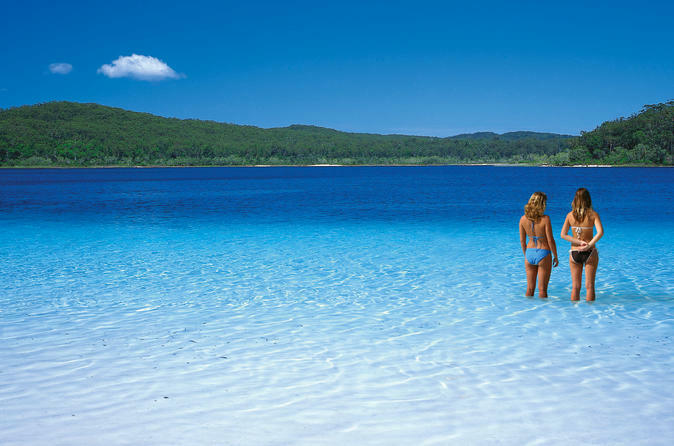 Expect to swim at pristine locations such as Lake McKenzie, Eli Creek, Champagne Pools and Lake Wabby. Stop for photo ops at the Maheno shipwreck, Indian Head, the Pinnacles and Seventy-Five Mile Beach. After a full day, head to a beach house that includes comfortable rooms, a pool and bar. Do and see more with an experienced guide to show you all of the best spots on the island.